Everyone is familiar with the seven wonders of the ancient world, so called because they were remarkable feats of architecture and engineering given the limited technology and primitive tools. However, some modern buildings too are nothing short of miracles as the technology and design used to build them are miles ahead of their time. Here is a list of the 10 modern architectural wonders of the world. This building is an architectural wonder for many different reasons. Firstly, it is the tallest building in the world as of 2018 and has been designed keeping in mind aesthetic appeal and stability of the building. It has more than 200 floors and has a height of 828 metres. This building located in Dubai has become one of the most recognisable buildings in the world and an instant tourist attraction. It has been designed according to Islamic tenets of architecture. It is one of the greatest modern architectural wonders around the world. The constriction of Burj Khalifa began in 2004 and completed in 2009. The primary material used in the construction was reinforced concrete. The building was officially opened in 2010 as a part of the new development called Downtown Dubai. It was designed by Skidmore, Owings & Merill (SOM), an American architectural, urban planning, and engineering firm. The building has three main entrances Armani Hotel, Residence and Corporate Suites and designed in such a way that smooth traffic levels maintained all the time. 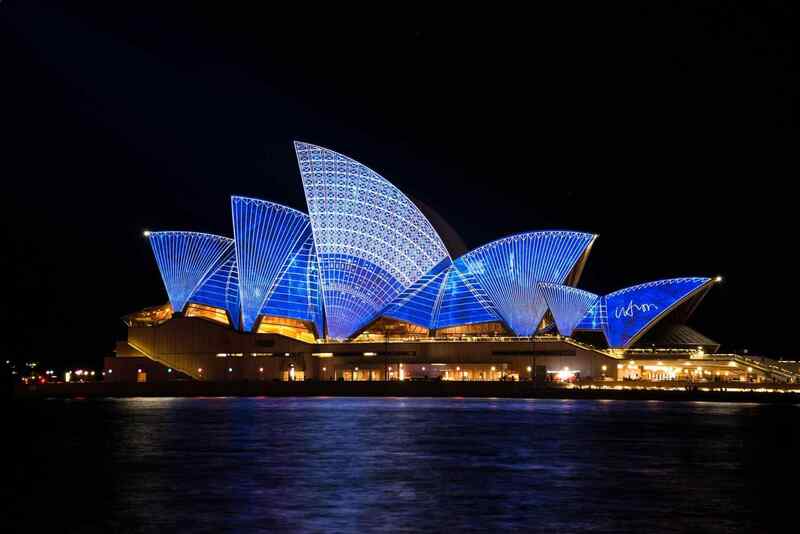 Located in Sydney, Australia, this building is famous for its distinctive shape and location on the coast of Sydney overlooking the beautiful sea. The construction of this building began in 1957 and was completed after 16 years. Today, this building hosts over 2 million visitors annually and has more than one thousand performances. The ceiling of the Opera House that has earned it worldwide fame is made up of 1 million ceramic tiles and lights of different colours are used to change the look of this building for special occasions. You will also like reading about the most famous bridges in the world. Also known as the National Grand Theatre, this modern architectural wonder is one of three buildings located in China that have made it to this list. The oval building was constructed using titanium and glass and was designed by French architect Paul Andrew to be completed in six years. During the construction, eighteen thousand titanium plates and one thousand glass sheets were used. This theatre has an opera house and several performance halls and is surrounded by an artificial lake. Beside modern, we also want you to read about the most famous monuments of ancient Egypt. This sports complex was specially built for the Beijing Olympics of 2008 and are one of the largest steel structures in the world. It has a structure similar to a bird’s nest and it cost $33 million and 28 kilometres of steel to build this stadium that was completed in five years. It has a seating capacity of 91,000 people and the roof is detachable to control the internal temperature of the stadium depending on which sport is being played inside. The symbolism of the bird’s nest is inspired by Chinese mythology and it depicts heaven. Additionally known as Bird’s Nest stadium was designed to be used in the 2008 Summer Olympics and Paralympics, however, it will also be used in the 2022 Winter Olympics and Paralympics. The stadium spans in the area of 258,000 square meters and has a seating capacity of 91,000 people including 80,000 permanent seats and 11,000 temporary seats with the international standard. The circular shape of the stadium represents ‘heaven‘.The pattern was inspired by Chinese-style ‘crazed pottery‘.Nowadays, the stadium is mostly used for football matches. This museum in Bilbao city, Spain was designed to be modern art and it is built using glass and titanium. It has an irregular shape the curves are built using titanium rods. It was designed by American-Canadian architect Frank Gehry and opened in 1997. It has nineteen galleries for displaying various pieces of part of which ten are irregularly shaped and some have stone interiors. The exterior of this structure reflects light and gives a magnificent look to the building. The museum was inaugurated by former King Juan Carlos I of Spain on October 18, 1997. It is considered one of the most important structures of its time because it changed the way people think about museums in the world in an aspect of its art, architecture, and collecting. The interconnected buildings make it the largest museums in Spain. It spans in the area of 24,000 square meters and approximately 11,000 square meters are dedicated to exhibition space. The largest gallery of the museum is 30‭ ‬meters wide and 130‭ ‬meters long and two sculptures outside the museum known as Puppy and Maman. The third modern headquarters is one of the architectural wonders in China, this building has an irregular geometrical shape and is made up of two leaning towers that merge at the top by meeting perpendicularly. It has been frequently described as ‘a three-dimensional cranked loop’. The construction of this building started in 2004 and it was inaugurated in 2012. In 2013, it was named as the best tall building in the world. Despite the unusual shape and leaning towers, this building is designed to withstand high seismic activity. The second Opera House to make it to this list, this structure is located in Valencia in Spain and is designed by Spanish architect Santiago Calatrava. It took ten years to be completed and was inaugurated in 2005. It is the tallest Opera Houses in the world, with seventeen floors of which three and underground. The roof of this structure is its most amazing aspects and it has been constructed with steel to stand free. The radiant white colour of the building is because of the white tile mosaic that covers the roof. The Palace is divided into three sections which host musical performances, conferences and operas. The Petronas Towers in Kuala Lumpur, Malaysia are the tallest twin structures in the world with each of the towers having 88 floors. This building was inaugurated in 1999 and was the tallest structure in the world for five years until the Taipei 101 was built in 2004. The towers are renowned for their panelling technique which used 33000 stainless steel and 55000 glass panels and has noise reduction and sunlight filtering properties. The buildings are joined by a two-way bridge that connects the towers on the 41st floor. The tallest twin towers in the world serve the headquarters of Petronas (National petroleum company of Malaysia) designed by the Argentine-born American architect Cesar Pelli. The 21st-century icon for Kuala Lumpur has a distinctive postmodern style shaped in eight-pointed stars based on simple Islamic geometric forms of two interlocking squares. The form of the building depicts Islamic principles of “unity within unity, harmony, stability and rationality”. This building located in the heart of London is remarkable not only because of its shape and appearance but also because it was the first eco-friendly skyscraper in London. The shape can be described as curvilinear and the building material is mainly glass and steel. It is known as the Gherkin because of its distinctive shape. The architectural wonders are one of the buildings that have natural ventilation and sunlight. The more than 700 glass panels and glass dome at the top is coated to prevent the loss of heat making the building very energy efficient. It has offices on most of the floors, but the top floor is a club that offers a panoramic view of London city, especially beautiful at night. You can also read about fascinating tombs and mausoleum in the world. The supertall skyscraper in Taipei was officially the tallest building in the world till 2004. The construction of the building started in 1999 and finished in 2004 with a height of 508 meters measured from the ground till to the tip of the spire on top. The iconic structure was designed by Taiwanese architecture firm C.Y. Lee & Partners and dominated heavily from Chinese culture. The interior and exterior are in Chinese pagoda form and shape resemble bamboo flowers. The unique feature is featureblue-green glass curtain walls that prevent heat and UV protection and blocks external heat by 50 per cent. Taiwan is prone to typhoon winds and ground-shattering earthquakes, so, building a large structure is a challenging task and hence a tuned mass damper (TMD) is incorporated into the structure. The 660-tonne steel mass is suspended between the 87th and 92nd floors because it helps in transfer of energy from the building to the swinging sphere and hence providing a stabilizing force. Every city has its own quirky and modern buildings that quickly become landmarks. Be it because of the ingenious design, the environmentally friendly engineering, building materials used or the overall appearance of the structure, modern architectural wonders are true sights to behold. Maybe these buildings will earn a name in the future as the current seven wonders of the world have today. Now, you are aware of modern architectural wonders. These are the 10 modern architectural wonders of the world.